1 A None No Power Seat 1 A is a standard Business Class seat that users describe has having excellent privacy. 15 A None No Power Seat 15 A is a standard Premium Economy Class seat with extra legroom. 15 C None No Power Seat 15 C is a standard Premium Economy Class seat with extra legroom. 15 D None No Power Seat 15 D is a standard Premium Economy Class seat with extra legroom. 15 F None No Power Seat 15 F is a standard Premium Economy Class seat with extra legroom. 15 G None No Power Seat 15 G is a standard Premium Economy Class seat with extra legroom. 15 H None No Power Seat 15 H is a standard Premium Economy Class seat with extra legroom. 15 K None No Power Seat 15 K is a standard Premium Economy Class seat with extra legroom. 17 G None No Power Seat 17 G is a standard Premium Economy Class seat. 17 H None No Power Seat 17 H is a standard Premium Economy Class seat. 17 K None No Power Seat 17 K is a standard Premium Economy Class seat. 22 C None No Power Seat 22 C is a standard Economy Class seat whose proximity to the lavatories and galley may be bothersome. 22 D None No Power Seat 22 D is a standard Economy Class seat whose proximity to the lavatories and galley may be bothersome. 22 G None No Power Seat 22 G is a standard Economy Class seat whose proximity to the lavatories and galley may be bothersome. 22 H None No Power Seat 22 H is a standard Economy Class seat whose proximity to the lavatories and galley may be bothersome. 23 A None No Power Seat 23 A is a standard Economy Class seat with extra legroom due to the Exit Row however, the proximity to the lavatories and galleys may be bothersome. This seat is missing a window. 23 B None No Power Seat 23 B is a standard Economy Class seat with extra legroom due to the Exit Row, however, the proximity to the lavatories and galley may be bothersome. 23 C None No Power Seat 23 C is a standard Economy Class seat with extra legroom due to the Exit Row, however, the proximity to the lavatories and galley may be bothersome. 23 H None No Power Seat 23 H is a standard Economy Class seat with extra legroom due to the Exit Row, however, the proximity to the lavatories and galley may be bothersome. 23 J None No Power Seat 23 J is a standard Economy Class seat with extra legroom due to the Exit Row, however, the proximity to the lavatories and galley may be bothersome. 23 K None No Power Seat 23 K is a standard Economy Class seat with extra legroom due to the Exit Row however, the proximity to the lavatories and galleys may be bothersome. This seat is missing a window. 24 D None No Power Seat 24 D is a standard Economy Class seat with extra legroom, however, the proximity to the galley may be bothersome. 24 F None No Power Seat 24 F is a standard Economy Class seat with extra legroom, however, the proximity to the galley may be bothersome. 24 G None No Power Seat 24 G is a standard Economy Class seat with extra legroom, however, the proximity to the galley may be bothersome. 35 H None No Power Seat 35 H is a standard Economy Class seat in the last row of the aircraft that may have limited recline. The proximity to the lavatory and galleys may be bothersome. 35 J None No Power Seat 35 J is a standard Economy Class seat in the last row of the aircraft that may have limited recline. The proximity to the lavatory and galleys may be bothersome. 35 K None No Power Seat 35 K is a standard Economy Class seat in the last row of the aircraft that may have limited recline. The proximity to the lavatory and galleys may be bothersome. 36 A None No Power Seat 36 A is a standard Economy Class seat in the last row of the aircraft that may have limited recline. The proximity to the lavatory and galleys may be bothersome. 36 C None No Power Seat 36 C is a standard Economy Class seat in the last row of the aircraft that may have limited recline. The proximity to the lavatory and galleys may be bothersome. 36 D None No Power Seat 36 D is a standard Economy Class seat in the last row of the aircraft that may have limited recline. The proximity to the lavatory and galleys may be bothersome. 36 F None No Power Seat 36 F is a standard Economy Class seat in the last row of the aircraft that may have limited recline. The proximity to the lavatory and galleys may be bothersome. 36 G None No Power Seat 36 G is a standard Economy Class seat in the last row of the aircraft that may have limited recline. The proximity to the lavatory and galleys may be bothersome. 7 D None No Power Seat 7 D is a standard Business Class seat whose proximity to the lavatory and galley may be bothersome. 7 H None No Power Seat 7 H is a standard Business Class seat whose proximity to the lavatory and galley may be bothersome. 8 H None No Power Seat 8 H is a standard Business Class seat whose proximity to the galley may be bothersome. As ANA’s newest aircraft, the Boeing 787-9 Dreamliner is outfitted with 215 seats and is used primarily on international routes. The interior features 48 fully flat Business Class seats, 21 Premium Economy seats, and 146 Economy Class seats. I was originally set for a middle seat at the exit row, which I think was 27b. However, 20C, an aisle seat, opened up, and I got it. There is a bulkhead in front of this row, separating you from what I guess is Economy Plus, but the bulkhead is far enough away that it is not a problem. Plus, the bulkhead does not extend all the way to the aisle seat. I flew this from SIN-NRT, very comfortable. No, it's not business class, but then again, I did not have to pay an extra US$1200. Very comfortable seat, if you sit on the window you even have extra space to put your bags in! Has maximum recline, and is not bothersome at all. This seat is actually fairly wide and the lay-flat feature goes completely flat. I'm a big person and I could sleep in various positions comfortably. Flew from HND to MUC. Seat is fine, offers good room and very good privacy. Since only 4 seats per row, you have at any time access to the aisle (and lavatory). It is noteworthy that there is practically no storage room for small items or a laptop. You have to keep it below the footrest. Seat is reasonably comfortable. Entertainment system easy to operate and good view. This was my first flight with ANA and I was looking forward to Japanese top notch service. However, I learned that the service level was at Western European airlines at most. Service was taking long time to serve food. Beverage service slow and not very attentive. Food selection limited, I was not able to get what I wanted to have (was asked, with apologies, to take the other choice). When having the meal, beverage service not actively done - Lufthansa does much better in business class. During flight, no buffet or similar. Overall, service level o.k. but far away from outstanding. 1H is very close to a storage location where a catering cart is kept. The crew was constantly openig a door on the aisle across from the seat, unlatching the cart, retrieving an item (plates or cups - something noisy) and then going through the noisy process of securing the cart. It was difficult to sleep with the constant noise. Also, the aisle is narrow at this point, and passengers boarding tend to bump into you in your seat that is directly on the aisle. Zero privacy in this seat. I had the seat 7F and I enjoyed it. I personally think that the privacy was sufficient with the person next to you. I wasn't annoyed by the people walking next to my head when I ws sleeping, even tho there weren't much people walking. I then had the seat 13K where the privacy was superb. Unfortunately you have less space than the H one, but you are closer to the window. The space from getting to your seat and the alley was a bit tight. I flew in seat 34K and it was frankly miserable. ANA has gone too far in trying to fit more seats in economy. 17.3" of seat width is extremely confining. The feeling of being trapped was quite pronounced. Being squished up against the window meant sitting sideways for 10+ hours. It was not a good flight and very disappointing. ANA really shoot themselves in the foot with their economy seating policies. On the one hand some of their planes such as the 787-900 I took from SYDHND were excellent with a 33-34 seat pitch (contrary to the information here). Reasonable space between rows for a 20-hour journey SYD to CDG is what attracted me to fly with them. But then a 787-800 was substituted on the leg from HND to CDG and came with a jam-packed 31 (perhaps less for aisle seats near the rear, where 27A/K is missing a window). Their website doesnt list seat pitches, so it seems to be luck of the draw, meaning taller customers cant choose ANA with an certainty of comfort in economy. 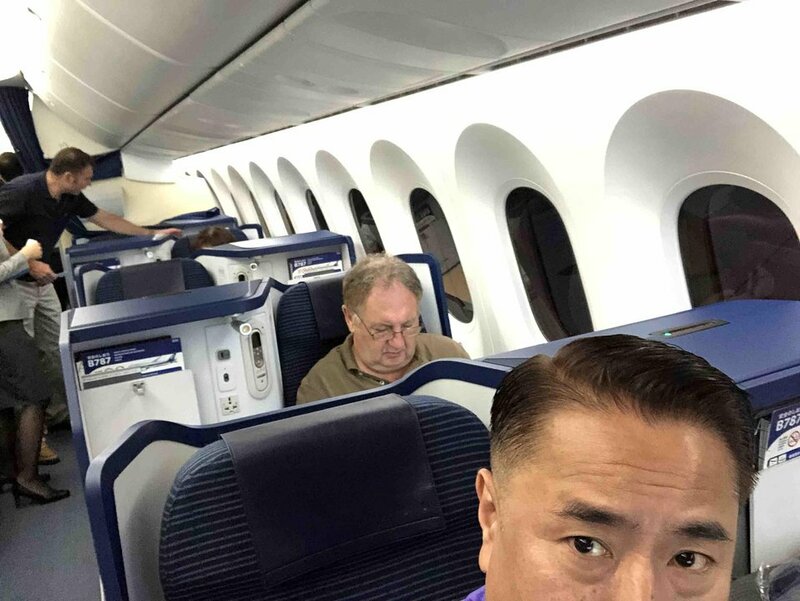 Oh, and 9 seats across in 787s seems to be the new squashy standard  just dont try any activities that require elbows is what Id suggest! Seat 1A is the very special seat, very isolated and quite seat. I love that.